The content area is where all the information you want to share with your site users goes. it is comprised of segments of information that is format so that user intuitively understand what goes together. To achieve this structure Lakekit.net uses the Elementor drag and drop content management system. By using Elementor Lakekit.net makes the content creation process quick and uncomplicated. 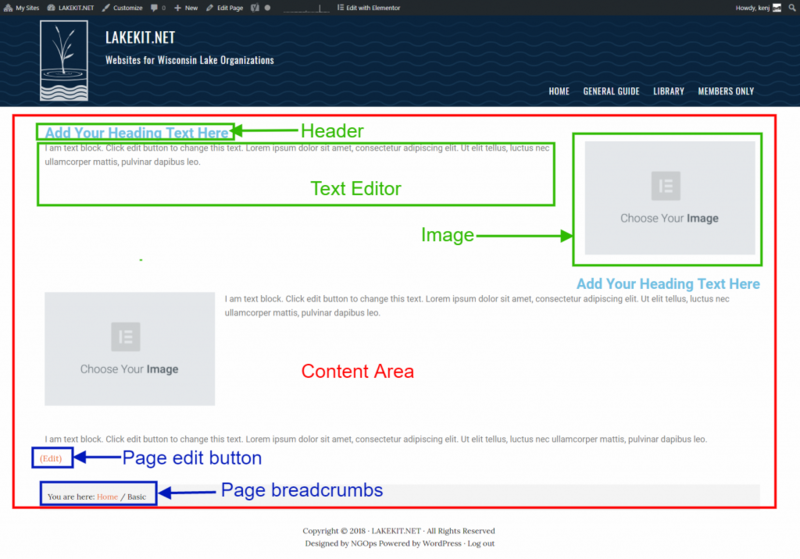 The power in the Lakekit.net template system lies in how we use the Elementor system to create a predesigned page layout into which the content is added. These block can be copied, reused, moved or deleted to meet the needs of the site. There are two uncontrollable elements on every Lakekit.net page. There is the edit button that appears only to individual that have the ability to edit that particular page such as the page author, site editor, or the site administrators. And there are the page breadcrumbs at the bottom of the page that inform a user where they are on the site in relations to the home page. Both of these are automatic features of the site and are automatically created and placed on the page by the website itself and as such do not need to be managed.